India needs to develop a global strategy encompassing investments and politics. It is time the government looked at security, foreign flows and foreign affairs in an integral fashion and constituted inter-ministerial groupings. Perhaps, experts could develop a geo-strategic approach to our investments abroad and at home. There is a chorus out there for foreign investments, in the form of FII and FDI, that are touted as the panacea for all our ills. The percentage of investments in various activities ranges from 26 to 100. There is automatic approval — one of the best oxymorons nowadays — and the red carpet welcome, what with single windows and multiple doors at the State level. However, one important aspect that has not been given adequate attention is that of national security. We need to think this issue through carefully and, perhaps, have an inter-ministerial geo-strategic group look at various issues of strategy in the evolving global situation before celebrating the foreign funds flow. We should know the sources of the funds and who the ultimate shareholders are as that can have important implications. One remembers the reluctance of the British-controlled oil companies to refuel India’s Air Force planes during the 1965 war with Pakistan because the then British Government was not favourably inclined towards India. It is also well-established that in the 1970s, the Allende government in Chile was overthrown using the power of American companies, including a well-known telecom giant of the time. There are concerns now about some Chinese companies and others with suspected connections to Pakistan’s ISI. 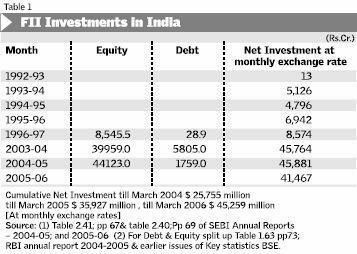 Table 1 shows the Foreign Institutional Investment that has come into India in the last few years. Nearly $45 billion were the cumulative flows till March. One intriguing aspect of the FII flow is the source of funds or the identity of investors. The Participatory Note (PN) route makes it impossible to identify the ultimate investor. It is suggested that more than 50 per cent of the FII investment could be by this route. The ultimate investor could, for all we know, be someone from the Cayman Islands or the Bahamas, and it could easily be groups or institutions that are not necessarily friends of India. They could pull out the funds in a concerted fashion and de-stabilise the markets or, worse, act in concert to create instability. The regulator should know the provider of funds. Regulators and sovereign governments must practice what banks call Know Your Customer (KYC) norms. Till October, 150 FIIs registered themselves with the Securities and Exchange Board of India, taking their total to 973. As their numbers and variety grow, understanding them and protecting sovereign interests become increasingly complex. Also, the exposure of the FIIs in government securities has increased. India has become an attractive destination for foreign funds and all international investments come with a rider. If the rider merely pertained to higher risk adjusted return then it belongs to the purely financial domain. But, unfortunately, the real world is more complicated. Table 2 provides the country-wise composition of FDI. This is an under-estimation as it does not include NRI investment and other share acquisitions. The largest flows are from Mauritius or rather are routed through that country due to our bilateral tax agreement that allows investors tax benefits. Here, again, the main ownership and origin are opaque and the ultimate flow may be from some island, which is a tax haven. Unknown sources of funds raise four major isssues: It could be a process of money laundering. It could be controlled by anti-India elements. It could be used for destabilising the economy. It could be to control critical areas of our economy by inimical forces and it could also be used for espionage issues. Recently, there were reports about Chinese companies not being considered for operating port facilities. The Left parties made it an issue suggesting that we should not be `discriminating’ against some countries and that is time to get out the mindset of the 1960s. But it is well known that many Chinese companies are indirectly controlled by the Peoples Liberation Army (for instance, Huawei, an ICT company in Bangalore was established by a former PLA officer). It is not the question of this country or that, it is a question of taking a geo-strategic in the interest of India. For instance, the FEMA Notification 20/2000 banned FDI flows from Bangladesh and Pakistan. But it is possible for a Pakistan company to establish a unit in, say, Dubai or fund a third party unit and invest in India. The concerns about the telecom major, Orascom, are partly due to this even though it has Egyptian origins. This is an important issue as studies have found that a large number of corporates in Pakistan are ultimately owned by the Fauji Foundation (FF), Army Welfare Trust (AWT) Bahria Foundation (BF), Shaheen Foundation (SF) — all owned by different wings of the Armed Forces (See Paper presented by Dr Ayesha Siddiqa-Agha; Power, Perks, Prestige And Privileges: Military’s Economic Activities In Pakistan in “The International Conference on Soldiers in Business — Military as an Economic Actor”(Jakarta, October 17-19, 2000). Similarly, in China, the differences between the armed forces, the political party and the corporates are opaque and is a matter of concern to many international observers. For instance, recently the chief of the Shanghai government was sacked for siphoning of pension funds of the municipal workers that have been invested in the bond market. The fact that a high-level party functionary was deciding on investments of pension funds is a cause for concern and exposes the party-business nexus. The recent spurt in investment in real-estate by Russians and Germans in Goa is also a matter of concern, if it is not purely for return purposes. If we recall, a former cabinet minister confessed in the late 1990s that he could not identify who exactly owned a particular private airline, following an investigation of the issue. 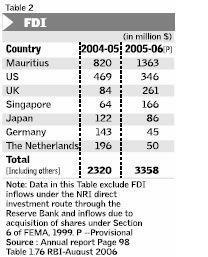 Of late, Indian investments abroad have also increased substantially with FDI outflows of about $4.5 billion in 2005-2006. Hence, an argument is put forth regarding reciprocity. This is done by experts who do not understand the power game. International relations and, more so, investments are not and need not be symmetric. It is an asymmetric world and we need to deal with it. If we want to become a big power, then we need to cultivate a global strategy encompassing investments and politics. It is high time the government looked at security, foreign flows and foreign affairs in an integral fashion and constituted inter-ministerial groupings. Perhaps, experts could develop a geo-strategic approach to our investments abroad and other investments here. Let us discriminate and play the asymmetrical game and add to the imbalances if it is going to help our perspectives. We are not here to create symmetry. Let us recognise that with all the noise and fanfare the foreign component of our investment is still much less than ten per cent. It is the domestic savings of our households, which sustain our investments and not the foreign flows.